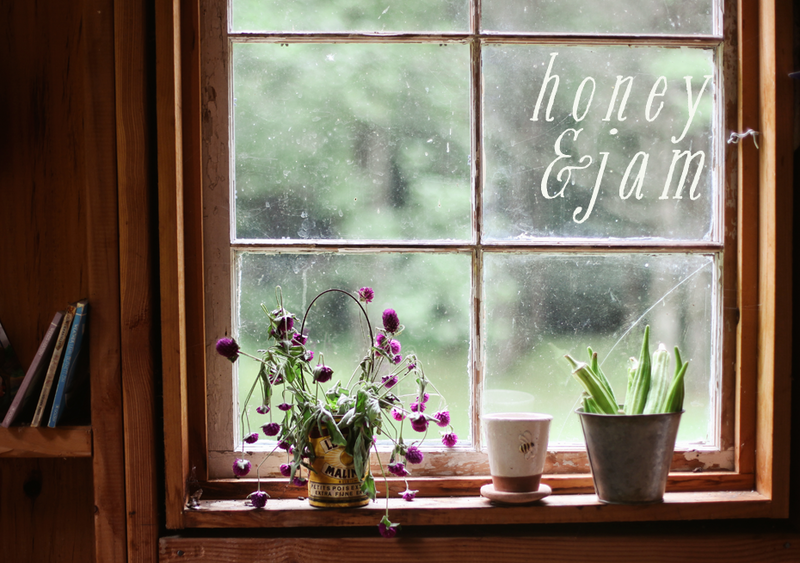 honey & jam | recipes + photos: Dandelion Green & Asparagus Tart, filled with disaster. 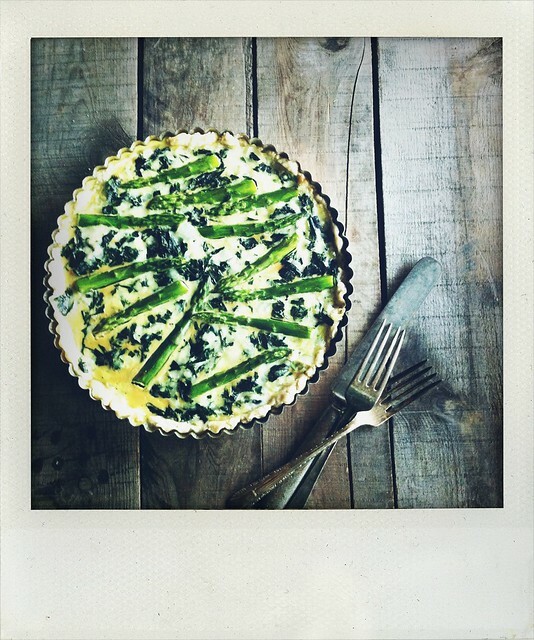 Dandelion Green & Asparagus Tart, filled with disaster. And then I dropped the tart on the floor. And I laughed, because really, what else can you do? I’m a morning person. I can see that look you're giving me right now. A morning person? And you don’t even drink coffee? Yup. I’m that annoying person who is stupidly cheerful first thing. I love the early morning light and the birds chirping and dewy grass and a cuppa tea. This morning, I was not that person. I was cranky as all get out. There were dishes piled up in my sink, ones I needed to wash before I could get to work. I couldn’t find the bottom of my tart pan. The one I’m always losing, because some people (me), should not be allowed to buy things with multiple parts, because they will lose them. I get down on my knees, body half way into the dark cabinet, rooting around for said tart pan, when the dogs start barking, scaring the wits out of me, so I bang my head on the top of the cabinet. I found the pan, though! Then my stove top won’t light. There will be no sautéing of the onions. Okay, I’ll microwave them to soften em up a bit. No big. My crust looks weird. I think I pre-baked it too long. Am I out of milk? I should plan better. I finally get it in the oven. I check on it and see it’s leaking. I go to yank it out and the rack moves, sending it careening towards the back of the oven. I let out a “NOO!! !”, and grab it with my bare hands. I hop around, hand in the air, doing a “it hurts!” dance. I get it back in, on a cookie sheet this time. My kitchen starts smelling like overcooked egg, thanks to the bit of filling the hit my oven floor. I gag a bit. Can we all agree that’s one of the worst smells ever? It comes out and it looks beautiful. I run it down to my little table by the window, nearly falling down the stairs on the way, to take photos. My camera dies. I put my battery on to charge and take the tart back upstairs, cut out a piece to try, and then drop the thing on the floor. Asparagus everywhere. A cute little puppy licking the floor, happy as a clam to clean up 10 bucks worth of cheese for me. And I laugh. Because seriously?! I occasionally get emails saying "your life looks so lovely and perfect!". It's not all wildflowers in mason jars and farm fresh eggs around here. Some days look like this. Imperfect, frustrating, and also kind of hilarious. 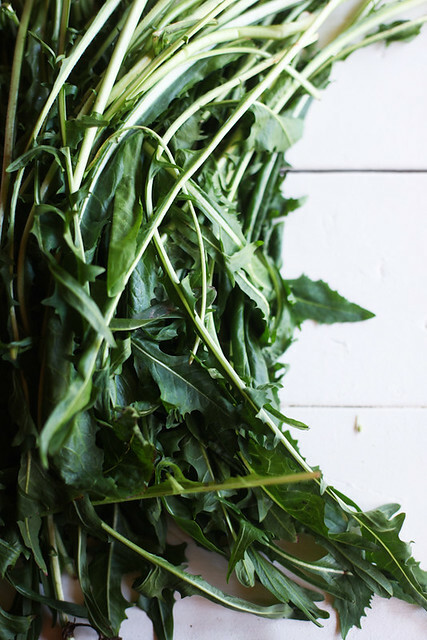 Cut the tough stems from the dandelion greens, about 1 inch from the bottom, and wash in two changes of water. Bring a large pot of water to a boil, and fill a bowl with ice water. When the water comes to a boil, salt generously and add the dandelion greens. Blanch four minutes and transfer to the ice water. Drain, squeeze out excess water and chop. Preheat the oven to 375 degrees. Heat the olive oil in a large nonstick skillet over medium heat, and add the onion. Cook, stirring, until tender, about five minutes, and add a pinch of salt and the asparagus. Cook, stirring, for seven or eight minutes, until the asparagus have softened and the onions are golden. Add the garlic and cook for another minute, then stir in the dandelion greens. Stir together for a minute, and remove from the heat. Season to taste with salt and pepper. Beat the eggs in a large bowl. Brush the bottom of the pastry shell, and place in the preheated oven for five minutes. Remove from the oven. 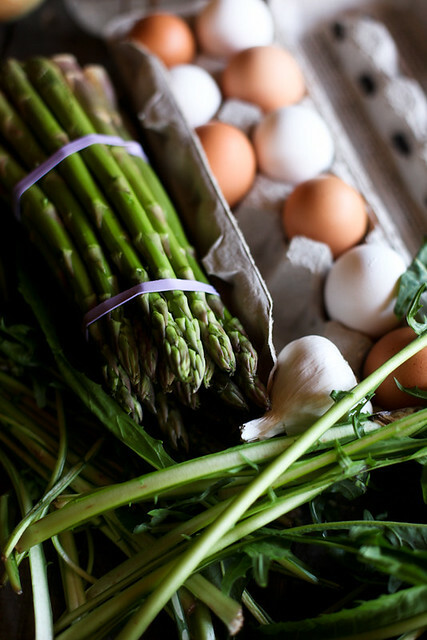 Whisk the milk into the eggs, add 1/2 teaspoon salt, freshly ground pepper to taste and stir in the cooked vegetables and cheese. Turn into the crust. Bake 35 to 40 minutes, until set and the top is lightly browned. Remove from the heat and allow to sit for 15 minutes before serving. Serve hot or warm. PS, a HUGE thank you for all the kind words of congratulations on my last post. Y'all are the best! In other exciting news, h&j was nominated as one of the "best baking and desserts blogs" over at the Saveur Food Blog Awards! How cool is that? I'm in such great company and it's such an honor. You can vote for your faves today and tomorrow! Ha! I love these stories because I love real life. Even your messes are beautiful, my friend. Love this totally real life story! Dandelion greens eh? I keep hearing about using the greens or the dandelions to make jelly and seems strange. Might just have to give it a try. Not too long ago, I didnt give a lot of thought to leaving feedback on blog page articles or blog posts and have placed responses even much less. Reading through through your enjoyable posting, will support me to do so sometimes. I'm glad you could laugh it off! It looks beautiful though! This looks delicious! I'm glad I'm not the only one who searches through the cabinet on hands and knees looking for that one pan. Great post, good work. It Couldn’t be wrote any better. Reading this post reminds me of my recent employer! He constantly kept talking about this. I will forward this article to him. Pretty sure he will have a delightful read. Thanks for posting..
Awww that stinks! I would sit down, light a candle, and eat off the floor. Real life. Oh Hannah, I think we've all been there too many times. And dropping something you've just baked, put your time and love into, is just heartbreaking. I hope you at least got a piece, this tart sounds incredible! That shot you did get is beautiful, and kind of blots out all the other crap that went on. Your life still looks 'lovely and perfect' to me :) Congratulations on the nomination---well deserved! I loved reading this. I loved that you laughed when your tart hit the floor. I probably would have had a few choice words before calling my happy pup over : ) And now you've got me hankerin' for some sort of tart! Thanks for sharing. We've all had those kind of days! The tart looks wonderful. Don't apologize for the iPhone photo. It's great! Do you have a Trader Joe's nearby? That cheese would have been about $4 instead of $10! I totally would have ate another pieces even after it fell on the floor ;) looks amazing! Me too! And thanks for making me laugh! Even the title of this post had me laughing. 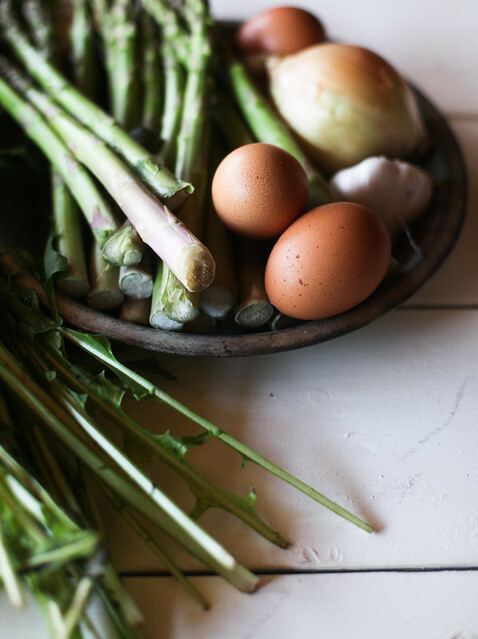 Can't you pick dandelion greens in your yard? I do. They go great in soup. Hahaha! Oh, you poor thing! I've had a few of those days myself lately. This tart looks absolutely delicious! And I'm just so excited for you and that nomination of yours! Awww so sorry to hear you dropped it :( That's happened to me far too many times. Ha I go through these rough mornings a lot! GAH, you poor thing, I know exactly what you've been through. I RELATE. I am the world's worst klutz which is not at all helpful for food making or pretty-picture-taking. But hey, at least we laugh about it! Thats whats important. I loved this post. I bake and cook and most of it turns out and then some just don't. It's real. I like it. I will continue to follow you and your recipes. I may even try dandelion greens! Good thing you are a morning person! Try a cucumber mojito, I bet you would feel even better about the situation. I LOVE dandelions--I grew up eating them because my grandmother would pick them from the lawns as she pushed me along in a stroller. Happy Nesting! 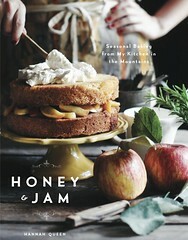 It looks utterly delicious! So gutted for you that it then fell. Argh! I'm sorry about your tart but I LOVE hearing about other peoples' baking disasters - it happens to everyone and makes a blog so much more real when you admit to them. You still managed to snap a gorgeous shot! So sad, but still sounds and looks so delicious. I'll definitely have to try it some time. Oh I just heard your news! Congrats on the cookbook. I love your recipe. I still make your almond vanilla cupcakes with strawberry frosting for my major events. Sorry to hear about your cooking disaster but how nice you got to try something new and tasty! hah, sounds like everyday in my kitchen. This post was thoroughly entertaining and I must say, amidst all the chaos - it turned out looking beautiful! p.s I have to agree with you on the burning egg mix smell. Mind you burning overflowed gf bread is pretty horrendous too, I set the fire alarm off recently with that one. It was about 10pm and all I could do also was laugh, that and try to turn the damn thing of as quick as I could so the kids didn't wake up! Despite the events surrounding this tart, it sure looks lovely! I just voted for you on Saveur the other day. Best of luck! ha! Sorry you lost your tart, but on the bright side, at least you cut a piece before it fell!! Goodness, I'm still laughing from your post. I'm sure I can speak for the rest of us when I say this has happened to us all! Some days just start on the wrong foot and just get worse and worse as the day progresses. Hopefully you've got it all out of your system for now and won't have another one like this soon! I share the same philosophy on buying new-to-me produce though. If you don't try it you'll never know! It's how I learned to love things like celeriac and kohlrabi. Sadly, one day I did buy dandelion greens to give them a try but something happened, let's just call it "laziness", and it ended up dying a slow death in the crisper. I'm gonna try it again though! So happy to see other people are as human as me! Sounds exactly like something I would do. At least you managed 1 good shot! SO in love with this entry today. We have all been there, good for you to share the experience. This gives me more reason to go and try those dandelion greens next time! Ah, we all have days like that, though I think I may have wrestled the puppy to retrieve another slice it sounds so delicious!! This is hilarious! The other day I was whisking a giant bowl containing 3 dozen eggs when it wobbled itself right over. Yes, grossest smell ever. You did the right thing m'lady, you have to laugh or you'll cry sometimes! That looks delicious! I have never cooked anything with dandelion greens. I wish I could take pictures like yours one day. They are beautiful, full of light and colors, they are natural and generous. Also in Italy we use a lot dandelion green in salads or quiches. This is my first time i visit here. I discovered so numerous interesting stuff in your weblog especially Thanks. This is truly a great read for me. t is extremely helpful for me. Are you struggling with understanding the rules of basketball, but you love watching it anyway? If so, you are not alone. Plenty of people don’t know a lot about basketball. You can never be too well-researched when it comes to purchasing jewelry. One mistake can cost you a fortune. Following are some sensible tips regarding the issue. This information can guide you in selecting and caring for jewelry pieces, and help you avoid some common pitfalls.